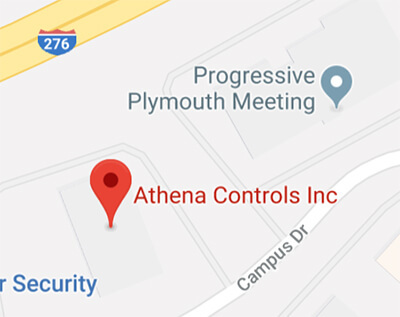 Please contact Athena Controls directly. Please contact your local representative Bradley & Associates, Chino Hills, CA. In Southern California please contact your local representative Bradley & Associates located in Chino Hills, CA. Please contact your local representative Source Atlantic in Wyomissing, PA. Please contact your local sales representative Douglas Davis, LLC located in Cape Elizabeth, ME. Please contact your local sales representative Source Atlantic located in Wyomissing, PA.
We also have an authorized stocking distributor Thermal Devices located in Mt. Airy, MD. For Southern Jersey please contact your local sales representative Source Atlantic LLC located in Wyomissing, PA. Please contact your local sales representative QED Distribution located in Charlotte, NC. We also have authorized stocking distributors BMS Burns located in Medina, OH.